A California judge has blocked new Trump administration regulations on birth control from applying in 13 states and Washington DC. The rules allow employers and insurers to decline to provide birth control if doing so violates their “religious beliefs” or “moral convictions”. The rules were to come into effect nationwide from Monday. But the judge granted an injunction stopping it applying in jurisdictions which are challenging the policy. Plaintiffs in 13 states and the nation’s capital argued that the new regulation should not come into force while they moved forward with lawsuits against it. 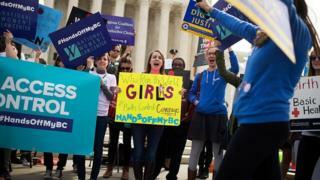 While Judge Haywood Gilliam did not make a final decision, he said the rules could mean a “substantial number” of women would lose birth control coverage, a “massive policy shift” which could breach federal law. Fifty-five million women benefited from the original Obama-era rule, which made companies provide free birth control. Before taking office, President Donald Trump pledged to eliminate the requirement. California attorney general Xavier Becerra said in a statement: “It’s 2019, yet the Trump administration is still trying to roll back women’s rights. But the US Department of Justice said in court documents that the new rules defended “a narrow class of sincere religious and moral objectors” and stopped them from conducting practices “that conflict with their beliefs”. Mr Becerra and his counterparts in the other states had asked for a nationwide injunction but Judge Gilliam limited the ruling to only those states moving against the new rules. Mr Trump’s rule change could force state governments to provide additional birth control coverage, Mr Becerra said, and pay health costs arising from unplanned pregnancies. Aside from California and Washington DC, the new rules will not yet apply in Connecticut, Delaware, Hawaii, Illinois, Maryland, Minnesota, New York, North Carolina, Rhode Island, Vermont, Washington and Virginia. The mandate requiring birth control coverage had been a key feature of so-called Obamacare – President Obama’s efforts to overhaul the US healthcare system. While the requirement included a provision letting religious institutions forgo birth control coverage for their employees, President Trump’s rule change widened the number of employers and insurers who could opt out, including on the grounds of “moral convictions”. Conservative and religious groups welcomed the shift, while civil rights and health groups have criticised the change.